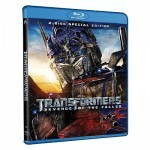 “Transformers: Revenge of the Fallen” will officially hit the streets Oct. 20. The Michael Bay film, which earned over $820 million at the box office, will come in a two-disc Blu-ray set, as well as single-disc and two-disc standard-def DVD versions. The two-disc Blu-ray Disc and DVD sets feature over 3 hours of extras, including a multi-chapter documentary that covers the entire making of the film. One featurette follows director Michael Bay as he travels to Japan for the opening of the film. Another covers the 25 year milestone of Hasbo’s Transformers toys. An exclusive to the Blu-ray release will be an interactive feature giving viewers the ability to customize their own robot characters, and to unlock an interview with Bay describing plans for the next film. The ‘Revenge of the Fallen’ Blu-ray Disc will be presented in 1080p resolution with a widescreen 16:9 format. Audio will be formatted in 5.1 DTS-HD Master Audio. – Seeds of Vengeance – Development and Design – After the overwhelming success of 2007’s Transformers, how do the filmmakers top themselves for the sequel? – Domestic Destruction – Production: United States – Michael Bay believes in going big: Big action and big explosions. Cast and crew are pushed to the limit as they traverse the U.S. from New Mexico to Pennsylvania. – Joint Operations – Production: Military – No other filmmaker in the world enjoys the kind of military access and cooperation Michael Bay has. Here we see just how efficient our armed forces are and the awe and respect shown by the cast. – Wonders of the World – Production: Middle East – You can’t really reproduce Egypt anywhere but Egypt so off we go to Giza and Luxor. – Start Making Sense – Editing – In order to turn over the massive amount of film as quickly as possible to VFX, four editors work tirelessly in a unique tag-team approach to shape the film. – Under the Gun – Visual Effects – Revenge of the Fallen features the most complicated VFX in film history. So complicated in fact that the filmmakers were unsure they would make the deadline. The DEVASTATOR VFX alone required 83% of ILM’s total render farm capacity. – Running the Gauntlet – Post-Production and Release – Working seven days a week, Michael Bay and company usher the film through sound design, Digital Intermediate color-timing and a globe-trotting whirlwind of premieres. • A Day with Bay: Tokyo–An intimate and fun all-access journey with Michael Bay as he travels to Tokyo, Japan for the world premiere of the biggest film of the year. • 25 Years of TRANSFORMERS–Access an all-new featurette celebrating a monumental milestone for one of Hasbro’s most successful and popular franchises. • NEST: Transformer Data-Hub–Explore conceptual artwork created by the production for 12 of the most popular AUTOBOTS and DECEPTICONS from the film. • Deconstructing Visual Bayhem with Commentary by Pre-Vis Supervisor Steve Yamamoto— A series of multi-angle pre-visualization sequences allowing viewers to learn how some of the film’s most spectacular scenes were created with an introduction by Michael Bay. • The ALLSPARK Experiment–Viewers get their chance to unleash the power of the recently recovered ALLSPARK shard on Earth vehicles. Begin by selecting and customizing a vehicle with a selection of parts and accessories. Then apply the ALLSPARK to this creation and watch what happens. Applying the ALLSPARK to certain custom combinations enables four new robot characters with special powers. If viewers discover all four, they unlock a fifth vehicle, which reveals a top secret message about the future of the TRANSFORMERS movie franchise. • Giant Effing Movie–A very personal look at the making of the movie. • The Matrix of Marketing–An archive of the film’s promotional media including trailers, posters and television spots. I think the plot was better in the first, but the effects better this time. why does amazon say reg price $39.99?